Affordable 4G? That’s the purpose behind the EE Kestrel. So does it take flight? Smartphones cost a fraction of what they used to. But inevitably to reduce price manufacturers have had to cut costs and, therefore, features. The first element to be left out is often 4G. So EE's new phone is a big change – the first budget-priced 4G handset. Is it any good? If you like Huawei's styling, you'll enjoy the Kestrel which is unmistakably the product of the Chinese manufacturer with its top edge which resembles many a smartphone with its flat front and curvy corners. Of course, it looks most like an enlarged, flattened iPhone 5c. But the bottom edge is rounded – like the Huawei Ascend P6. This isn't as thin as the P6 which was 6.18mm from front to back. This phone is far from fat but at around 8mm it's not a match for the premium phones currently available. Its weight, 145g, isn't bad and this phone doesn't feel heavy when you hold it. In fact, the overall dimensions (133 x 65 x 7.85mm) are highly manageable if not exceptional. Similarly, the matte dark grey back and surrounds are attractive but not ground-breaking. The headline feature on the Kestrel is its speed. To have 4G connectivity on a phone this price – and it's highly affordable both on pay-as-you-go and a contract handset with a £13.99 a month line rental – is remarkable. That price, incidentally, includes 500MB of data. Enough for most people, though no good if you plan to download movies all the time. Because EE was first to market with 4G, it's no surprise the network coverage is extensive and advanced. So much of it is what the company calls double speed 4G. And this phone can handle it easily, being capable of download speeds of up to 150Mbps – many phones can only go as high as 100Mbps. Realistically, you won't get close to that speed but this does mean the phone has some future-proofing built in. 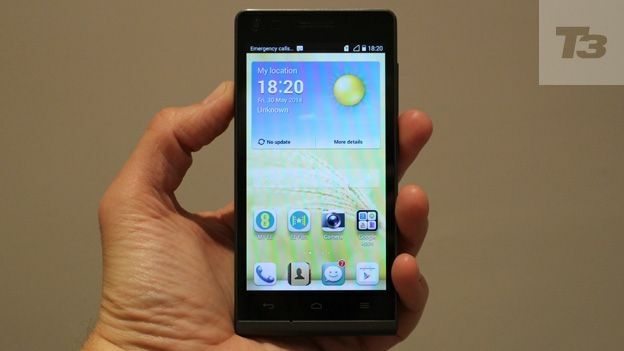 The Kestrel has a 4.5-inch screen with reasonable but not remarkable resolution. The 960 x 540 pixels equate to 245 pixels per inch. In practice, it's fine, just not as pin-sharp as top-end blowers. In terms of the screen, the Kestrel has the display you'd expect from the price tag. And this isn't a Clear Black Display screen such as you'd find on a Nokia, even the budget-priced Nokia Lumia 630. Nor does it have the use-with-your-gloves-on feature some displays now offer. Although a flash on a mobile phone camera rarely results in better images, it's still good to have one on board, and this phone lacks one. The camera is not especially high-resolution, just five megapixels. The operating system is clean and simple enough, with useful features such as a burst mode activated by holding your thumb on the shutter button. The front camera is just one megapixel, so nothing special. It's not a bad camera, but not the phone for a photo-lover. A phone this affordable can't include a decent processor, right? Well, the Kestrel manages quite a powerful chip – a quad-core model with 1.2GHz speed. The RAM is 1GB and the two combined deliver strong performance all round. Rarely did it seem slow or stuttery. Battery life on smartphones is always a tricky subject. The more you use your phone – and the more apps, the more chance you'll use it a lot – the shorter the battery will last. Still, this phone manages well over a day, which is sort of all you need assuming you remember to charge it each night. It's much better than some handsets which run dangerously low come afternoon tea. This isn't the best smartphone on the market, but it's very affordable, and has plenty going for it. Though the camera is average and the screen so-so, the killer feature is the 4G connectivity which is super-speedy and deeply impressive. At this price, with this data connection, this is a phone well worth a look.